Coagulation is the transformation of flowing blood into a stable gel, and the transformation is the result of complex enzymatic mechanisms that initiate when blood comes in contact with extravascular surfaces. The gelling of blood is accomplished when soluble fibrinogen molecules undergo enzymatic cleavage and assemble into insoluble fibrin fibers. The growing fibrin fibers will create a fine interconnected network and trap blood cells, forming a gel of blood termed coagulum or clot. The intricate enzymatic process of blood coagulation was first described in fullness during the year 1964. Davie and Ratnoff presented their theory of blood coagulation as a “waterfall sequence” of coagulation factor activation . Independently, and almost at the same time, very similar conclusions were drawn by Macfarlane who published his idea of the coagulation mechanisms as an “enzyme cascade”. Both publications describe how the activation of factor XII leads to a sequential activation of five coagulation factors in stepwise order, ending with the enzymatic cleavage of fibrinogen by the enzyme thrombin. This cascade theory laid the foundation for modern coagulation research. The functional enzymes in the coagulation cascades are termed coagulation factors and are assigned a specific roman number. To distinguish between an activated coagulation factor from the zymogen, the activated factor number is suffixed with an “a”. Five of the zymogens involved in the coagulation cascades are vitamin K-dependent serine proteases, factor VII, factor IX, factor X, prothrombin and protein C, all containing a characteristic domain with γ-carboxyglutamic acid residues (Gla domain) . The Gla domain have also been recognized to mediate the binding of the enzyme to phospholipid bilayers in a Ca2+ dependent manner . Inhibition of the γ-carboxylation of coagulation factors results in drastic attenuation of coagulation, and has for a long time been used in anticoagulation therapy by the administration of warfarin [reviewed in ]. There are two separate initiation mechanisms for the enzymatic coagulation cascade, both leading to the same endpoint; fibrin network formation. The two pathways following these initiation mechanisms are termed the intrinsic and extrinsic pathway. The names are derived from the fact that all functional components of the intrinsic pathway are blood borne, whereas the triggering component of the extrinsic pathway, tissue factor, is not found in blood, but in extravascular tissue. Although there are major differences in the activation mechanism and the subsequent enzymatic steps, both the intrinsic and extrinsic pathways converge into the common pathway, ultimately leading to fibrin formation. Extensive research in the area has with time revealed that these pathways are highly interconnected and also dependent on platelet surface association for proper function (for review see ). The extrinsic pathway is the main contributor to physiological activation of coagulation in vivo. The pathway is initiated by tissue factor (TF), an integral membrane glycoprotein found in extravascular tissue [7, 8]. TF can bind the blood born factor VII (FVII) as well as its active form, factor VIIa (FVIIa). FVII is mainly found in circulation as the inactive zymogen, but reports state that 1-2 % of the total amount is in the activated form, FVIIa . TF itself has no enzymatic function, but serves as a cofactor and facilitates rapid auto-activation of FVII and equally important, dramatically enhances the enzymatic activity of FVIIa . The TF:FVIIa (extrinsic Xase) complex can activate both factor X (FX) and factor IX (FIX) into their active forms , and as part of an initial amplification loop, both FX and FXI contribute to further initiation of coagulation by feedback activation of more FVII to FVIIa [11, 12]. Also, an inhibiting mechanism of FXa has recently been proposed, due to the fact that FXa remains reversibly bound to the TF:FVIIa complex after activation, hence blocking further activation of remaining FX . The small amounts of FXa that are initially formed lead to a limited conversion of the zymogen prothrombin to the enzymatically active thrombin. The minor amount of thrombin produced through the extrinsic Xase pathway is however insufficient for complete fibrin formation but is enough to activate platelets through PAR receptors as well as converting the cofactors factor V (FV) and factor VIII (FVIII) in the intrinsic pathway to their active forms. The activated FVIIIa can in turn form a complex with FIXa, previously activated by the extrinsic pathway. The FIXa:VIIIa complex (intrinsic Xase), preferentially assembles on the phospholipid membrane of activated platelets [14, 15], where it effectively activates FX at a far greater conversion rate than the extrinsic Xase complex . The rapidly forming FXa will thereafter form the prothrombinase complex together with FVa, also located on the phospholipid membrane . The FIXa:VIIIa and the FXa:FVa complexes are both highly efficient and will in short time raise thrombin concentration levels sufficiently to facilitate fibrin network formation. An additional amplification step constitutes the feedback activation of FXI by thrombin, subsequently generating activated FIX, and thereby boosting the ongoing activation of the intrinsic pathway . This amplification mechanism is however only considered relevant in a setting with a low level TF exposure , e.g. after tissue factor pathway inhibitor (TFPI) shuts down further TF-dependent activation . The activation of factor XI by thrombin has been proposed to occur on the platelet surface since both factor XI and thrombin can bind to the platelet receptor GPIba . The entire coagulation pathway, comprised of multiple steps of zymogen to enzyme conversions are indeed very nested and complex. However, FX activation, the point of convergence for the extrinsic and intrinsic pathways, has been deemed as the rate limiting step for thrombin generation . Once the massive thrombin generation has started, soluble fibrinogen is rapidly converted into soluble fibrin molecules that immediately start to assemble into fibrin fibers in a favorable reaction. Activation of the extrinsic pathway by tissue factor and the follow enzymatic coagulation cascade are visualized in Figure 1. Figure 1. Tissue factor bearing cells in the damaged vessel wall can initiate the extrinsic coagulation cascade. The other pathway that leads to thrombin formation is by the intrinsic pathway, also termed the contact activation pathway; the name derived from its intriguing initiation mechanism where factor XII undergoes auto-activation triggered by the contact with a surface interface. Ratnoff et al was the first to discover factor XII in 1955 and named it Hageman factor, from the name of the first studied patient with factor XII deficiency. The deficiency was brought to attention when neither blood nor plasma from Mr. Hageman coagulated properly during incubation in test tubes . These primary findings have lead to the unveiling of the contact activation system, regulated by three plasma proteins; factor XII, prekallikrein (PK) and high molecular weight kininogen (HMWK). The pathway is initiated as factor XII binds to a surface and thereby undergoes spontaneous cleavage of its single peptide chain, rendering the zymogen into a fully active serine protease comprised of two polypeptide chains held together by a disulfide bond . Three separate sites on the factor XII molecule have been characterized and proposed to facilitate its important interactions with surfaces [25-27]. The activated factor XII on the surface converts both factor XI and prekallikrein to their activated forms, factor XIa and kallikrein respectively. Factor XII is also a substrate for kallikrein and the pair thereby forms a short reciprocal activation loop, enabling rapid activation of the intrinsic pathway . Factor XI is not the exclusive substrate for factor XIIa but can also be activated by thrombin and factor XIa , and it is the activation by thrombin that is considered to be the physiological relevant pathway since deficiency of factor XI but not that of factor XII results in bleeding tendencies [30, 31]. Factor XI activity are enhanced by association with the platelet membrane , and it has been demonstrated that the GPIb-IX-V receptor facilitate binding of factor XI to the platelet surface . Also, the interaction of factor XI and prekallikrein with surfaces are to a large extent mediated by HMWK. The dual function of HMWK; forming complex with factor XI and prekallikrein and binding to surfaces are both crucial for its procoagulant role in coagulation. It has been shown that inhibition of one or the other function by directed monoclonal antibody blocking results in a complete loss of the procoagulant property of HMWK . HMWK is also cleaved during the contact activation process by kallikrein, liberating bradykinin , a peptide mediator that induces anti-thrombotic responses in the vascular tissue . The intrinsic pathway activation is propagated downstreams by factor XIa, subsequently activating the vitamin K-dependent zymogen factor IX . Facor IX then activates factor X, the factor that links the intrinsic and extrinsic pathways. Prothrombin can then be converted into active thrombin by the activated factor Xa. However, this initial thrombin formation is limited to proceed at a slow rate since both factor IXa and factor Xa lack their respective cofactor, factor VIIIa and factor Va. Thrombin, but also factor X can convert the pro-cofactors into active cofactors, facilitating the formation of the FIXa:FVIIIa (intrinsic Xase) and the FXa:FVa (prothrombinase) complex on a phospholipid surface [38, 39]. This complex formation is essential for rapid formation of thrombin; its necessity reflected by a ~50,000 fold increase in enzymatic activity for factor XIa , and a ~1,000 fold increase for factor Xa . As both complexes become functional, large amounts of thrombin will be generated, converting fibrinogen into fibrin, ultimately resulting in fibrin network formation. The physiological role of factor XII in haemostasis and thrombosis have for a long time been a subject for investigation, especially since deficiencies in factors VIII, IX and XI from the intrinsic pathway cause bleeding disorders , while a deficiency in the first factor in this pathway, factor XII, does not cause any bleeding [23, 31]. Recently a patophysiological role for FXII in thrombosis was proposed as it was showed that FXII-deficient mice do have defective thrombus formation in arterial beds and are protected against thromboembolism induced by collagen and epinephrine . The authors furthermore speculated that FXII-driven thrombin generation might proceed on the platelet surface. Naturally occurring surfaces that can facilitate the autoactivation of factor XII have also been thoroughly investigated. A recent report presented results that indicate that FXII might be activated by polyphosphate anions released by activated platelets . Another exogenous source of contact activation may be the lipopolysaccharides found on the surface of bacteria during sepsis [43, 44]. Exposed collagen is also a proposed endogenous activator of FXII, and although reported results have pointed both in favor and against this concept, the consensus is that collagen type I, that is found in the subendothelial matrix can facilitate autoactivation of FXII [41, 45, 46]. The thrombus formation process is a composite mechanism with great capacity for intrinsic amplification. The amplification will ensure a fast enzymatic route that will prevent excessive blood loss in the event of vessel injury. However, for such a powerful pro-thrombotic system there is also a need for regulatory functions, to stop thrombus growth from spreading too far away from the site of injury. Protein C is activated by thrombin to activated protein C (APC), the mechanism dependent on the association of thrombin and protein C with the endothelial cell membrane protein, thrombomodulin. APC, together with its cofactor protein S, functions as an inhibitor of coagulation by inhibiting the cofactors factor Va and factor VIIIa through enzymatic cleavage . It has been found that thrombin is an allosteric enzyme that shows two different conformations depending on Na+ binding. The thrombin conformation where Na+ is bound yields a higher efficiency towards activation of fibrinogen and the PAR receptor while the conformation without Na+ is slower. The thrombin activation rate of the coagulation inhibitor protein C is however not affected and is the same for both conformations . Another inhibitor of the coagulation system is the tissue factor pathway inhibitor (TFPI), which is able to inhibit both factor Xa and the TF-factor VIIa complex . Antithrombin (AT) is a protein that can trap thrombin and thus inhibit thrombin’s enzymatic capabilities. Heparin binding enhances the activity of AT mediated inactivation of thrombin profoundly by colocalization of the two proteins . Several of the inhibitors that are involved in the coagulation process belong to the serpin protein superfamily (reviewed in ), that inhibit their target protease by forming a covalent bond to its catalytic site . Coagulation and platelet activation have turned out to be tightly integrated processes. 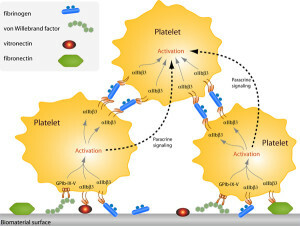 Thrombin, the key enzyme in the coagulation cascade, is a potent platelet agonist, acting on the platelet PAR receptors 1 and 4, and conversely, activated platelets are known to enhance and contribute to the overall coagulation process via several independent mechanisms (reviewed in [60, 61]). In this aspect, it has been found that the platelet phospholipid membrane acts as one of the main contributors to coagulation by catalyzing several enzymatic steps in the coagulation cascade. The major constituents of the platelet membrane are phosphatidycholine (PC), 38%; phosphatidylethanolamine (PE), 27%; sphingomyelin (SM), 17% and phosphatidylserine (PS), 10%. However, in the resting platelet membrane a considerable asymmetry is evident and almost no detectable PS and only 20% of the total PE is presented on the outer leaflet of the platelet surface . This asymmetry is maintained by the continuous action of aminophospholipid translocase, actively transporting PS and PE to the intracellular membrane leaflet by a flip-flop mechanism . The activation of the platelet will however lead to a rapid loss of asymmetry, exposing PS and more PE on the outer surface of the platelet. The mechanism is attributed to scramblase, a protein facilitating bidirectional movement of phospholipids between the two leaflets . The scrambled membrane will expose a slightly anionic surface due to negative net charge of PS. Together with Ca2+ the surface efficiently binds the coagulation factor complexes and thereby increase their activity significantly (reviewed in ). However, the relationship between PS exposure and procoagulant activity is far from clear , and more research on the subject is necessary. Another procoagulant mechanism is the concomitant release of a-granule content during platelet activation, the release resulting in a drastic increase in the local concentration of coagulation factors as well as fibrinolysis inhibitors at the site of the growing thrombus . After the clot has been formed, the activated platelets incorporated in the clot rearrange and contract their intracellular actin/myosin cytoskeleton. The intracellular actin network is connected to the internal part of the integrin αIIbβ3 fibrinogen receptor. Following coagulation, the external part of αIIbβ3 will have bound to the fibrin network of the clot, and therefore, as a result of platelet contractile force on the fibrin network, the formed clot will compact on itself and hence reduce its total volume. The mechanism is termed clot retraction, and it is considered that its main physiological function is to clear the obstructed vessel for renewed blood flow . Disrupting the fibrin binding capability of platelets with the use of integrin αIIbβ3 inhibitors results in a complete loss of clot retraction [69, 70]. Commonly used integrin ?IIb?3 inhibitors are abciximab, eptifibatide and tirofiban. Clot retraction can also be inhibited by the use of cytochalsin E, a cell permeable metabolite of fungal origin that prevents intracellular actin rearrangement [71-73]. After the haemostatic plug has served its purpose by preventing blood loss during the vessel repair process, it is cleared from the site by an enzymatic process termed fibrinolysis. The fibrinolytic system is a short enzyme cascade system, which ends in the degradation of the fibrin network into soluble products by the function of the key enzyme plasmin. Initiation of the fibrinolytic system can be accomplished by either tissue-type plasminogen activator (tPA) or urokinase-type plasminogen activator (uPA). tPA is secreted by endothelial cells and is in the presence of fibrin a strong activator that converts the zymogen plasminogen to its active form, plasmin. uPA is mainly found in urine, but has been shown to be secreted by several different cell types. uPA, in contrast to tPA, is not dependent on the presence of fibrin to convert plasminogen into plasmin [74, 75]. Both tPA and uPA exist in single chain precursor molecules (sctPA and scuPA) that can undergo enzymatic cleavage by plasmin. scuPA behaves as a zymogen and its enzymatic activity is increased by ~200% by the cleavage, whereas both sctPA and tPA functions with approximately the same efficiency. Interestingly, scuPA can also be activated by the contact activation enzymes factor XIIa and kallikrein in the intrinsic pathway of coagulation . The architecture of the fibrin network has been shown to affect the fibrinolytic process, and the degradation process proceeds drastically slower for thinner fibrin structures than for thicker fibrin structures . The fibrinolytic system has to be constrained by regulatory mechanisms to prevent it from interfering with the vital process of haemostatic plug formation. This is accomplished in numerous ways but the principal inhibitors are plasminogen activator inhibitor (PAI-1) , a2-macroglobulin , C1-inhibitor  and thrombin activated fibrinolysis inhibitor (TAFI) . 1. Davie EW and Ratnoff OD. Waterfall Sequence for Intrinsic Blood Clotting. Science, 1964; 145(3638): 1310-1312. 2. Macfarlane RG. An Enzyme Cascade in the Blood Clotting Mechanism, and its Function as a Biochemical Amplifier. Nature, 1964; 202(4931): 498-499. 3. Mann KG, Nesheim ME, Church WR, Haley P, and Krishnaswamy S. Surface-dependent reactions of the vitamin K-dependent enzyme complexes. Blood, 1990; 76(1): 1-16. 4. Freedman SJ, Blostein MD, Baleja JD, Jacobs M, Furie BC, and Furie B. Identification of the Phospholipid Binding Site in the Vitamin K-dependent Blood Coagulation Protein Factor IX. J. Biol. Chem., 1996; 271(27): 16227-16236. 5. Hirsh J, Dalen JE, Anderson DR, Poller L, Bussey H, Ansell J, and Deykin D. Oral Anticoagulants: Mechanism of Action, Clinical Effectiveness, and Optimal Therapeutic Range. Chest, 2001; 119(1 suppl): 8S-21S. 6. Colman RW, Clowes AW, George JN, Goldhaber SZ, and Marder VJ, Overview of hemostasis, in Hemostasis and thrombosis : basic principles and clinical practice, R.W. Colman, Editor. 2006, Lippincott Williams & Wilkins: Philadelphia, PA. p. 3-16. 7. Bächli E. History of tissue factor. British Journal of Haematology, 2000; 110(2): 248-255. 8. Mackman N. Role of Tissue Factor in Hemostasis, Thrombosis, and Vascular Development. Arterioscler Thromb Vasc Biol, 2004; 24(6): 1015-1022. 9. Nemerson Y. Tissue factor and hemostasis. Blood, 1988; 71(1): 1-8. 10. Nemerson Y and Repke D. Tissue factor accelerates the activation of coagulation factor VII: The role of a bifunctional coagulation cofactor. Thrombosis Research, 1985; 40(3): 351-358. 11. Rao LV, Bajaj SP, and Rapaport SI. Activation of human factor VII during clotting in vitro. Blood, 1985; 65(1): 218-226. 12. Rao LV, Rapaport SI, and Bajaj SP. Activation of human factor VII in the initiation of tissue factor- dependent coagulation. Blood, 1986; 68(3): 685-691. 13. Hathcock J, Rusinova E, Vaananen H, and Nemerson Y. Lipid-Bound Factor Xa Regulates Tissue Factor Activity. Biochemistry, 2007; 46(20): 6134-6140. 14. Fay PJ. Regulation of factor VIIIa in the intrinsic factor Xase. Thromb Haemost, 1999; 82(2): 193-200. 15. Mertens K, Celie PH, Kolkman JA, and Lenting PJ. Factor VIII-factor IX interactions: molecular sites involved in enzyme-cofactor complex assembly. Thromb Haemost, 1999; 82(2): 209-17. 16. Mann KG, Butenas S, and Brummel K. The dynamics of thrombin formation. Arterioscler Thromb Vasc Biol, 2003; 23(1): 17-25. 17. Rosing J, Tans G, Govers-Riemslag JW, Zwaal RF, and Hemker HC. The role of phospholipids and factor Va in the prothrombinase complex. J. Biol. Chem., 1980; 255(1): 274-283. 18. Gailani D and Broze GJ, Jr. Factor XI Activation in a Revised Model of Blood Coagulation. Science, 1991; 253(5022): 909-912. 19. Keularts IM, Zivelin A, Seligsohn U, Hemker HC, and Beguin S. The role of factor XI in thrombin generation induced by low concentrations of tissue factor. Thromb Haemost, 2001; 85(6): 1060-5. 20. Wielders SJ, Beguin S, Hemker HC, and Lindhout T. Factor XI-dependent reciprocal thrombin generation consolidates blood coagulation when tissue factor is not available. Arterioscler Thromb Vasc Biol, 2004; 24(6): 1138-42. 21. Baglia FA, Shrimpton CN, Emsley J, Kitagawa K, Ruggeri ZM, Lopez JA, and Walsh PN. Factor XI interacts with the leucine-rich repeats of glycoprotein Ibalpha on the activated platelet. J Biol Chem, 2004; 279(47): 49323-9. 22. Rand MD, Lock JB, van’t Veer C, Gaffney DP, and Mann KG. Blood clotting in minimally altered whole blood. Blood, 1996; 88(9): 3432-3445. 23. Ratnoff OD and Colopy JE. A familial hemorrhagic trait associated with a deficiency of a clot-promoting fraction of plasma. J Clin Invest, 1955; 34(4): 602-13. 24. Cool DE, Edgell CJ, Louie GV, Zoller MJ, Brayer GD, and MacGillivray RT. Characterization of human blood coagulation factor XII cDNA. Prediction of the primary structure of factor XII and the tertiary structure of beta-factor XIIa. J. Biol. Chem., 1985; 260(25): 13666-13676. 25. Citarella F, Ravon DM, Pascucci B, Felici A, Fantoni A, and Hack CE. Structure/Function Analysis of Human Factor XII Using Recombinant Deletion Mutants. European Journal of Biochemistry, 1996; 238(1): 240-249. 26. Clarke BJ, et al. Mapping of a putative surface-binding site of human coagulation factor XII. J. Biol. Chem., 1989; 264(19): 11497-11502. 27. Pixley RA, Stumpo LG, Birkmeyer K, Silver L, and Colman RW. A monoclonal antibody recognizing an icosapeptide sequence in the heavy chain of human factor XII inhibits surface-catalyzed activation. J. Biol. Chem., 1987; 262(21): 10140-10145. 28. Vogler EA and Siedlecki CA. Contact activation of blood-plasma coagulation. Biomaterials, 2009; 30(10): 1857-69. 29. Naito K and Fujikawa K. Activation of human blood coagulation factor XI independent of factor XII. Factor XI is activated by thrombin and factor XIa in the presence of negatively charged surfaces. J. Biol. Chem., 1991; 266(12): 7353-7358. 30. Leiba H, Ramot B, and Many A. Heredity and Coagulation Studies in Ten Families with Factor XI (Plasma Thromboplastin Antecedent) Deficiency. British Journal of Haematology, 1965; 11(6): 654-665. 31. Mann KG. Biochemistry and physiology of blood coagulation. Thromb Haemost, 1999; 82(2): 165-74. 32. Baird TR and Walsh PN. Activated Platelets but Not Endothelial Cells Participate in the Initiation of the Consolidation Phase of Blood Coagulation. J. Biol. Chem., 2002; 277(32): 28498-28503. 33. Baglia FA, Badellino KO, Li CQ, Lopez JA, and Walsh PN. Factor XI Binding to the Platelet Glycoprotein Ib-IX-V Complex Promotes Factor XI Activation by Thrombin. J. Biol. Chem., 2002; 277(3): 1662-1668. 34. Schmaier AH, Schutsky D, Farber A, Silver LD, Bradford HN, and Colman RW. Determination of the bifunctional properties of high molecular weight kininogen by studies with monoclonal antibodies directed to each of its chains. J. Biol. Chem., 1987; 262(3): 1405-1411. 35. Kerbiriou DM and Griffin JH. Human high molecular weight kininogen. Studies of structure-function relationships and of proteolysis of the molecule occurring during contact activation of plasma. J. Biol. Chem., 1979; 254(23): 12020-12027. 36. Colman RW and Schmaier AH. Contact system: a vascular biology modulator with anticoagulant, profibrinolytic, antiadhesive, and proinflammatory attributes. Blood, 1997; 90(10): 3819-43. 37. Sinha D, Seaman FS, and Walsh PN. Role of calcium ions and the heavy chain of factor XIa in the activation of human coagulation factor IX. Biochemistry, 1987; 26(13): 3768-3775. 38. Fay PJ. Activation of factor VIII and mechanisms of cofactor action. Blood Rev, 2004; 18(1): 1-15. 39. Nicolaes GA and Dahlback B. Factor V and thrombotic disease: description of a janus-faced protein. Arterioscler Thromb Vasc Biol, 2002; 22(4): 530-8. 40. Roberts HR and Ma AD, Overview of inherited hemorrhagic disorders in Hemostasis and thrombosis : basic principles and clinical practice, R.W. Colman, Editor. 2006, Lippincott Williams & Wilkins: Philadelphia, PA. p. 877-886. 41. Renne T, et al. Defective thrombus formation in mice lacking coagulation factor XII. J. Exp. Med., 2005: jem.20050664. 42. Smith SA, Mutch NJ, Baskar D, Rohloff P, Docampo R, and Morrissey JH. Polyphosphate modulates blood coagulation and fibrinolysis. Proceedings of the National Academy of Sciences of the United States of America, 2006; 103(4): 903-908. 43. Herwald H, Morgelin M, Olsen A, Rhen M, Dahlback B, Muller-Esterl W, and Bjorck L. Activation of the contact-phase system on bacterial surfaces[mdash]a clue to serious complications in infectious diseases. Nat Med, 1998; 4(3): 298-302. 44. Morrison DC and Cochrane CG. Direct evidence for hageman factor (factor XII) activation by bacterial lipopolysaccharides (endotoxins). J. Exp. Med., 1974; 140(3): 797-811. 45. Kawamoto Y and Kaibara M. Procoagulant activity of collagen. Effect of difference in type and structure of collagen. Biochim Biophys Acta, 1990; 1035(3): 361-8. 46. Koenig JM, Chahine A, and Ratnoff OD. Inhibition of the activation of Hageman factor (factor XII) by soluble human placental collagens types III, IV, and V. J Lab Clin Med, 1991; 117(6): 523-7. 47. Blomback B. Fibrinogen and fibrin–proteins with complex roles in hemostasis and thrombosis. Thromb Res, 1996; 83(1): 1-75. 48. Blomback B, et al. Native fibrin gel networks and factors influencing their formation in health and disease. Adv Exp Med Biol, 1990; 281: 1-23. 49. Blomback B, Carlsson K, Hessel B, Liljeborg A, Procyk R, and Aslund N. Native fibrin gel networks observed by 3D microscopy, permeation and turbidity. Biochim Biophys Acta, 1989; 997(1-2): 96-110. 50. Muszbek L, Yee VC, and Hevessy Z. Blood coagulation factor XIII: structure and function. Thromb Res, 1999; 94(5): 271-305. 51. Pisano JJ, Finlayson JS, and Peyton MP. Cross-link in Fibrin Polymerized by Factor XIII: epsilon-(gamma -Glutamyl)lysine. Science, 1968; 160(3830): 892-893. 52. Board PG, Lososky MS, and Miloszewski KJA. Factor XIII: Inherited and acquired deficiency. Blood Reviews, 1993; 7(4): 229-242. 53. Carr ME, Jr., Gabriel DA, and McDonagh J. Influence of factor XIII and fibronectin on fiber size and density in thrombin-induced fibrin gels. J Lab Clin Med, 1987; 110(6): 747-52. 54. Esmon CT. The roles of protein C and thrombomodulin in the regulation of blood coagulation. J. Biol. Chem., 1989; 264(9): 4743-4746. 55. Di Cera E. Thrombin Interactions. Chest, 2003; 124(3 suppl): 11S-17S. 56. Bajaj MS, Birktoft JJ, Steer SA, and Bajaj SP. Structure and biology of tissue factor pathway inhibitor. Thromb Haemost, 2001; 86(4): 959-72. 57. Li W, Johnson DJD, Esmon CT, and Huntington JA. Structure of the antithrombin-thrombin-heparin ternary complex reveals the antithrombotic mechanism of heparin. Nat Struct Mol Biol, 2004; 11(9): 857-862. 58. Rau JC, Beaulieu LM, Huntington JA, and Church FC. Serpins in thrombosis, hemostasis and fibrinolysis. Journal of Thrombosis and Haemostasis, 2007; 5(s1): 102-115. 59. Olson ST, Bock PE, Kvassman J, Shore JD, Lawrence DA, Ginsburg D, and Björk I. Role of the Catalytic Serine in the Interactions of Serine Proteinases with Protein Inhibitors of the Serpin Family. J. Biol. Chem., 1995; 270(50): 30007-30017. 60. Brass LF. Thrombin and platelet activation. Chest, 2003; 124(3 Suppl): 18S-25S. 61. Monroe DM and Hoffman M. What Does It Take to Make the Perfect Clot? Arterioscler Thromb Vasc Biol, 2006; 26(1): 41-48. 62. Schick PK and Panetti TS, Platelet and megakaryocyte lipids, in Hemostasis and thrombosis : basic principles and clinical practice, R.W. Colman, Editor. 2006, Lippincott Williams & Wilkins: Philadelphia, PA. p. 591-604. 63. Bevers EM, Tilly RHJ, Senden JMG, Comfurius P, and Zwaal RFA. Exposure of endogenous phosphatidylserine at the outer surface of stimulated platelets is reversed by restoration of aminophospholipid translocase activity. Biochemistry, 1989; 28(6): 2382-2387. 64. Wolfs JL, Comfurius P, Rasmussen JT, Keuren JF, Lindhout T, Zwaal RF, and Bevers EM. Activated scramblase and inhibited aminophospholipid translocase cause phosphatidylserine exposure in a distinct platelet fraction. Cell Mol Life Sci, 2005; 62(13): 1514-25. 65. Zwaal RF, Comfurius P, and Bevers EM. Lipid-protein interactions in blood coagulation. Biochim Biophys Acta, 1998; 1376(3): 433-53. 66. Ramstrom S, Ranby M, and Lindahl TL. Platelet phosphatidylserine exposure and procoagulant activity in clotting whole blood–different effects of collagen, TRAP and calcium ionophore A23187. Thromb Haemost, 2003; 89(1): 132-41. 67. Reed GL, Platelet secretion, in Platelets, A.D. Michelson, Editor. 2007, Academic Press/Elsevier: Amsterdam ; Boston. p. 309-318. 68. Nurden AT, Human platelet membrane glycoproteins, in Haemostasis and thrombosis, A.L. Bloom, Editor. 1994, Churchill Livingstone: Edinburgh. p. 115-166. 69. Ramstrom S, Ranby M, and Lindahl TL. The role of platelets in blood coagulation–effects of platelet agonists and GPIIb/IIIa inhibitors studied by free oscillation rheometry. Thromb Res, 2002; 105(2): 165-72. 70. Seiffert D, Pedicord DL, Kieras CJ, He B, Stern AM, and Billheimer JT. Regulation of clot retraction by glycoprotein IIb/IIIa antagonists. Thromb Res, 2002; 108(2-3): 181-9. 71. Olorundare OE, Simmons SR, and Albrecht RM. Cytochalasin D and E: effects on fibrinogen receptor movement and cytoskeletal reorganization in fully spread, surface-activated platelets: a correlative light and electron microscopic investigation. Blood, 1992; 79(1): 99-109. 72. Osdoit S and Rosa J-P. Fibrin Clot Retraction by Human Platelets Correlates with alpha IIbbeta 3 Integrin-dependent Protein Tyrosine Dephosphorylation. J. Biol. Chem., 2001; 276(9): 6703-6710. 73. Yahara I, Harada F, Sekita S, Yoshihira K, and Natori S. Correlation between effects of 24 different cytochalasins on cellular structures and cellular events and those on actin in vitro. J. Cell Biol., 1982; 92(1): 69-78. 74. Cesarman-Maus G and Hajjar KA. Molecular mechanisms of fibrinolysis. British Journal of Haematology, 2005; 129(3): 307-321. 75. Rijken DC and Lijnen HR. New insights into the molecular mechanisms of the fibrinolytic system. Journal of Thrombosis and Haemostasis, 2009; 7(1): 4-13. 76. Booth NA and Bachmann F, Plasminogen – Plasmin system, in Hemostasis and thrombosis : basic principles and clinical practice, R.W. Colman, Editor. 2006, Lippincott Williams & Wilkins: Philadelphia, PA. p. 335-364. 77. Gabriel DA, Muga K, and Boothroyd EM. The effect of fibrin structure on fibrinolysis. J. Biol. Chem., 1992; 267(34): 24259-24263. 78. Yepes M, Loskutoff DJ, and Lawrence DA, Plasminogen activator inhibitor – 1, in Hemostasis and thrombosis : basic principles and clinical practice, R.W. Colman, Editor. 2006, Lippincott Williams & Wilkins: Philadelphia, PA. p. 365-380. 79. Cummings HS and Castellino FJ. Interaction of human plasmin with human .alpha.2-macroglobulin. Biochemistry, 1984; 23(1): 105-111. 80. Davis Iii AE, Mejia P, and Lu F. Biological activities of C1 inhibitor. Molecular Immunology, 2008; 45(16): 4057-4063. 81. Mosnier LO and Bouma BN. Regulation of Fibrinolysis by Thrombin Activatable Fibrinolysis Inhibitor, an Unstable Carboxypeptidase B That Unites the Pathways of Coagulation and Fibrinolysis. Arterioscler Thromb Vasc Biol, 2006; 26(11): 2445-2453.